My crock pot and I. Continuing with my series called “What’s for dinner Mom?” I want to tell you about the newest member of my appliance family. Her name is Betty Crockpot and I had to go to Sweden in order to buy her. 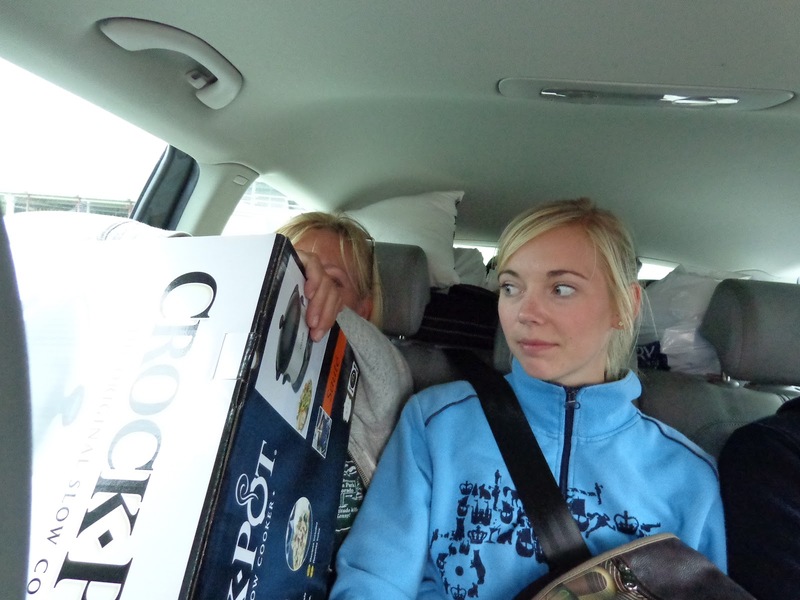 Being an American mom who loves to cook and lives in Norway can be a challenge. There are so many things that you cannot get over here. Two things that I have really missed in my kitchen are a garbage disposal and a Crock Pot. When we built our new kitchen I finally got a garbage disposal through E-bay and talked the plumber into installing it, you see I am not entirely sure it is legal here. While my son was here from the states we took him on a ferry over to Sweden and as all Norwegians do, we stopped at the big shopping center to buy food and drink because it is so much cheaper in Sweden. My husband needed an adapter for the cooler so we stopped into a hardware store and there she was. It was as if I had found a long lost friend as I touched her black stoneware sides and stood there in awe. She was beautiful, just as I remembered her. My husband finally found me standing there with big round dewy eyes and it didn’t take long before I was walking out of that store with my baby in arms. There was no room for her in the back of our car, so I sat with her in my lap for the long drive to our family’s cabin. It was hard to leave her in the box for the week-end, but I did much to my dismay because when we arrived home I unpacked her only to find the wrong size and model inside. This was not my Betty, but her sister. 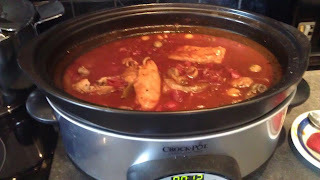 A smaller round crockpot more suited for soup then roasts and with no thermostat. My heart sunk. Back into the box she went and my husband, who is forever proving to be my hero, took and exchanged her a few days later while making a service call near Sweden. I waited patiently for his return and when he did I had a piece of beef already waiting to be turned into a delicious pot roast. I plugged Betty in and ZAP! All the circuits in our kitchen went out. As it turned out there was a major problem with her wiring and no amount of surgery could fix her. I packed her away and made my pot roast in the oven. Needless to say, I was totally heart broken and lost all faith for made in China and bought in Sweden. Maybe I was just not meant to have a crock pot. Once again my hero would not give up and he took the dead crock pot back with him into Sweden and exchanged it once again. This time before coming home he stopped at our cabin and tested it out with his Dad. Now Betty is home and resting comfortably on my kitchen counter. She can’t wait to get started cooking and to show my family just what she can do, even though she is from Sweden and made in China, she is totally American to me. Place sliced onions on bottom of crock pot. Add chicken. Stir together remaining ingredients and pour over chicken. Cook on low 7-9 hours or high 3-4 hours. Serve over pasta or rice, with a salad on the side. There is a secret I have been dieng to share with you, as well as some exciting things happening this week-end so come back tomorow for an extra post from me! If you haven't visited Minnie yet, go pay her and my Gibberish friends a visit HERE. Rumor has it that she is coming back from vacation on Sunday. Have a fantastic week-end! Labels: Crockpot, What's for Dinner Mom? Sorry you got home with the wrong one! Especially after seeing the photo of you holding it in the car. Sounds like it was worth the wait though. I don't know what I'd do without my Crockpot...I would've cried if it had taken that many tries to get one...LOL Sounds like you have an awesome husband! A love affair with a crockpot. I have never really used one as I am not a big cook. When I do, it's usually pasta. My sister loves hers and she makes great chili. I'll have to pass this recipe on to her. I would absolutely die without my crock pots we have four. A triple set for making multiple, sauces, soups, stews, or sides usually used when I pre-cook for the week or when we entertain. Then there is the one that we can do roasts, bar-b-que, and chili in. I don't know how you lasted without Betty and am glad you got her! Not being a great cook, I really need to experience a crock pot meal to appreciate why some are potty about the crock pot. 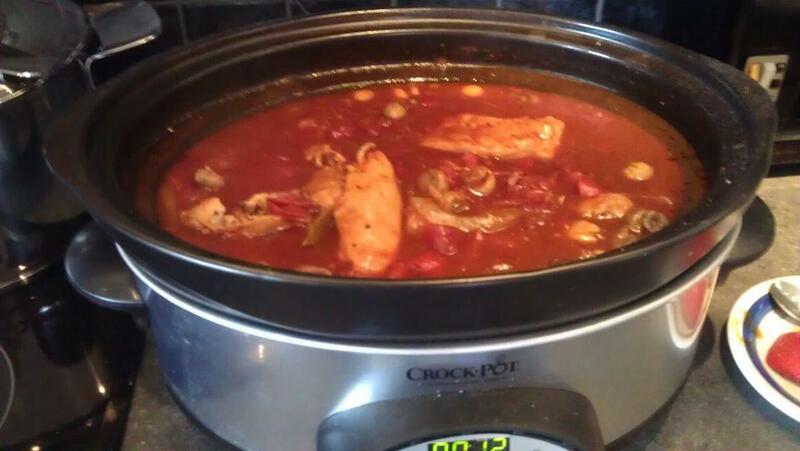 Glad you finally got your crock pot....The cacciatore looks awesome.... I guess you must have gotten the Italian cooking gene.... LOL. I missed that one. I cook but only simple things. I'm the baker in my house.